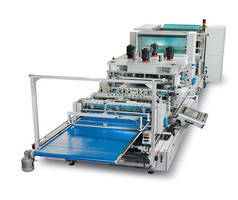 Technipaq’s new packing machines include a Platen Sealing Pouch System, which is designed for the high-efficiency production of chevron and medical pouches. It has increased process control and intelligent sealing technology and toolless die changes for increased production efficiency. The company also added Vision Detection System on pouch converting machines for increased quality assurance. It has high-resolution camera detection and customized software allowing for continuous product flow inspection. Anti-fraud Printing Solution targets pharmaceutical industry.